Preface (M. Launtens). Photocyclization and photocycloaddition reactions of 4- and 2-pyrones (F.G. West). Intramolecular [4+3] cycloaddition reactions (M. Harmata). Lewis acid catalyzed [2+2] cycloaddition reactions of vinyl sulfides and their analogues: catalytic asymmetric [2+2] cycloaddition reactions (K. Narasaka, Y. Hayashi). Vinylboranes as diels-alder dienophiles (D.A. Singleton). Preparation and exo-selective [4+2] cycloaddition reactions of cobaloxime-substituted 1,3-denies (M.E. Welker et al.). Index. 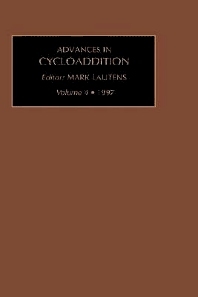 This is the fourth volume in the series, aimed at those wishing to stay abreast of developments in the mechanisms and synthetic applications of 1,3-dipolar cycloaddition reactions.